Gavin DeGraw Announces New Album “Something Worth Saving” Out September 9th – First Single “She Sets The City On Fire” Available Now! New York (July 15th, 2016) – Grammy-nominated and multi-platinum selling recording artist Gavin DeGraw has announced plans to release his fifth studio album SOMETHING WORTH SAVING on September 9th via RCA Records. Recorded in multiple cities in the U.S. including Miami, Los Angeles and Nashville, SOMETHING WORTH SAVING marks DeGraw’s first full length studio release in nearly three years, following 2013’s highly acclaimed MAKE A MOVE. 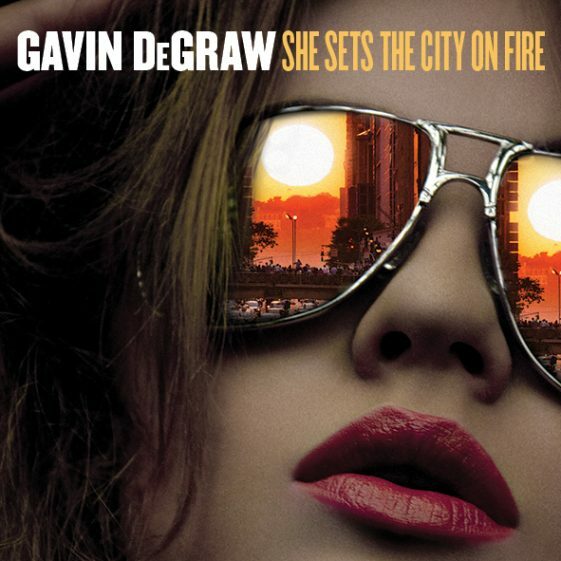 The first official album single “She Sets the City on Fire,” written by Gavin DeGraw and Gregg Wattenberg and produced by Gregg Wattenberg, is available today at all digital retailers and will officially impact US radio beginning July 25th. A lyric video for the track was also released today on VEVO. Click HERE to view. Gavin will soon head out on a co-headlining 2016 North American tour with Billboard chart-topping recording artist Andy Grammer. Kicking off with a homecoming show in Bethel, NY on August 28th, the multi-city trek will include shows in major theater venues across the US including the Greek Theatre in Los Angeles, Hammerstein Ballroom in New York City, The Fillmore in Philadelphia, and the Orpheum Theatre in Boston. Tickets for all shows are on-sale now. For complete purchase information, please visit www.gavindegraw.com. 10/5/16 Columbus, OH Express Live! Gavin DeGraw is a multi-platinum selling singer, performer and songwriter. He first broke through with the 2003 release of his debut album, Chariot, which sold over 1 million copies, earned platinum certification, and yielded three hit singles: “I Don’t Want To Be,” “Follow Through,” and the title-track, “Chariot.” Gavin’s self-titled second album debuted at No. 1 on the digital sales chart and at No. 7 on Billboard’s Top 200 album chart in 2008, earning Gavin his first Top 10 album. It spawned the hit singles “In Love With A Girl,” which Billboard dubbed “a rocking homerun,” and the gold-certified “We Belong Together.” In 2009, Gavin released Free as a gift to his die-hard fans clamoring for recorded versions of Gavin’s live favorites. His third studio album, Sweeter, was released in September 2011 and produced the smash single, “Not Over You,” co-written with OneRepublic’s Ryan Tedder. The track reached #1 on the Hot AC charts, was a top 10 hit on Top 40, and was certified double platinum. In 2013 DeGraw released his fourth studio album, Make A Move, which included the hit song “Best I Ever Had” and garnered rave reviews from such publications as Billboard, People and Entertainment Weekly amongst many others. In addition, Gavin was nominated for his first Grammy for “We Both Know,” the song he co-wrote with Colbie Calliat for the 2013 film, “Safe Haven.” Since then he has been consistently touring around the world, including sold out dates with the legendary Billy Joel. For more information visit www.gavindegraw.com-facebook.com/gavindegraw – twitter: @gavindegraw.